A Virtual Reality Telerehabilitation System (VRTS) using Virtual Reality was developed by a University of Pittsburgh research team, which enables clinicians to assess the wheelchair accessibility of building environments from a remote location. The system was successful to assess the accessibility without visiting the remote site. However, this system also had several limitations. In order to overcome these limitations, we adapted three new technologies: a web-based multimedia decision supporting system; an IP camera; Coded Targets. In this study, we tested the feasibilities of these technologies by applying them to the actual environments. Through this study, we could confirm that these new technologies can enhance the efficiency and accuracy of our remote accessibility assessment system. There are more than 2.2 million people age 15 and over using wheelchairs in the United Stated . Physical, social and environmental limitations prevent these individuals from participating in normal life. So not only is it important to improve the physical condition of the wheelchair user, it is equally significant to modify their living environment. The 1995 American Housing Survey (AHS) discovered that there are 8.9 million families have members with a physical disability, yet 57.4% had no house modifications. 5.1 million individuals with disabilities live in housing inappropriate for their conditions.There is a lack of architects and rehabilitation practitioners who have expertise of accessibility assessment, especially in rural areas. Distance and the lack of funds on the behalf of the wheelchair user also limit the possibility of on-site assessments. Therefore we developed a remote accessibility assessment system using virtual reality and 3D reconstruction technology. Prior studies showed that the use of a digital camera and Photomodeler software can make an acceptable virtual environment in which the accessibility can be evaluated without visiting the site . However the previous system showed some limitations. First of all, it is hard to take high quality pictures. Secondly, it requires time-consuming and tedious jobs to construct 3D model and finally there is a lack of communication between clients and clinician . In order to overcome these limitations, we developed a multimedia supporting system and adapted two advanced technologies: the IP camera and Coded Target. Verifying whether we can enhance the efficiency of 3D reconstruction. We built a Web-based Multimedia Decision Supporting System. 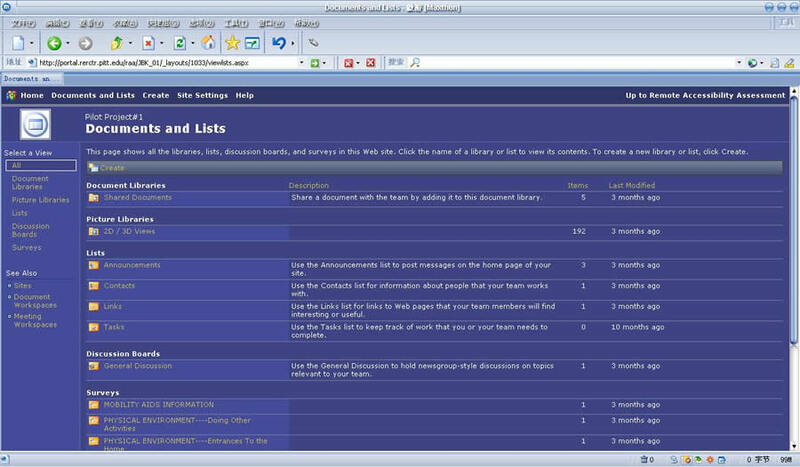 This system includes several parts: document libraries, picture libraries, lists, discussion boards and surveys. We created a pilot project to examine the efficiency of this system. Six project members: a technician, a home modification specialist, a clinician, a client, a caregiver and a family member were provided with an ID and password which allowed them to enter their project and the system common area. They had the right to browse the documents uploaded via internet and upload their information and data. However they were not allowed access to any other projects, also no one else was allowed access to this particular pilot project. The pilot project was base camped at a wheelchair user’s home. Seven architectural parts (two bathrooms, a hallway, a stair way, an entry room, a kitchen, and a back porch) were selected for accessibility assessment. We used D-Link@ IP camera to take pictures which targeted the physical environment is of a 10 square meter office. This kind of camera is supported by a wired and wireless system. We installed the camera as high and as close to the wall as possible. We manipulated the camera’s angle and zoom, and took snapshots via internet. 3)	Feasibility of Coded Targets. 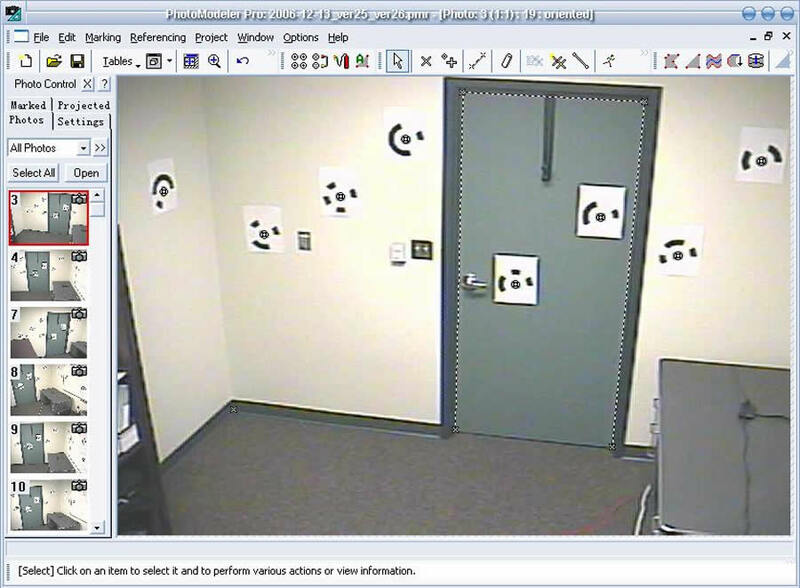 We created the Coded Targets utilizing an add-on, software module belonging to Photomodeler@ Pro 5 (Eos Systems Inc.). Each Coded Target has a special code ring that can be automatically detected and processed by the Photomodeler software. Before we took pictures, we attached these targets to each wall. Within each picture we shot, there were included at least 6 Coded Targets. We constructed the 3D model of the target office by Photomodeler Pro 5 with the photos we took by IP camera. We uploaded some shared documents about VRTS so that rehabilitation engineers and home modification specialists could update their information about this system and client. Original pictures and constructed 3D models of each part of a wheelchair user’s home were also uploaded into picture libraries. Then the complete 3D model including all parts was created and uploaded. The architect can access a complete or partial view of given wheelchair user’s home easily and measure the target objects in the reconstructed 3D virtual reality environment. Through these measurements, some suggestions can be made regarding possible modification of a wheelchair user’s house. All parties involved in this pilot project can easily discuss all topics regarding any modification of the wheelchair user’s house. We created a preliminary information survey form that requests information regarding such as the wheelchair user’s mobility aids, physical environment, client’s needs, and health professional’s recommendations. The client and his/her regional health professionals can conveniently complete the survey via the internet. This also allows project members to easily access this information. We used an IP camera, to take pictures. Each picture met our qualification standards and included at least 6 Coded Targets. Each significant point of the objects we wanted to build was prominent and obvious. This included the door, the furniture and the wall corner. The quality and definition of the pictures taken by the IP camera were not different from those taken by the digital camera which we used in previous studies. We were able to construct a reliable 3D model using these pictures. We used a total of 26 Coded Targets on four walls, averaging 6 targets on each wall. Each Coded Targets either faced the camera directly or was on a considerable angle was easily detected by the Photomodeler software. Before we built a 3D model we needed to orient the pictures we chose. Photomeodelr was able to identify and process automatically the same target regardless of the picture chosen. Each picture which included marked Coded Targets was oriented automatically and accurately. This occurred before we marked the significant point of the aimed objects. With the automatically oriented 3D model, we can mark our target object easily, measure them, and assess the accessibility. Through these feasibility tests, we investigated the applicability and adaptability of three new technologies: multimedia decision supporting system, IP camera, and Coded Targets. Through multimedia decision supporting system, all participating project members can share their information and data via internet. This system resolves the distributional disproportion of rehabilitation resources especially in rural area where the people with a disability lack the contact with clinical and architectural experts. 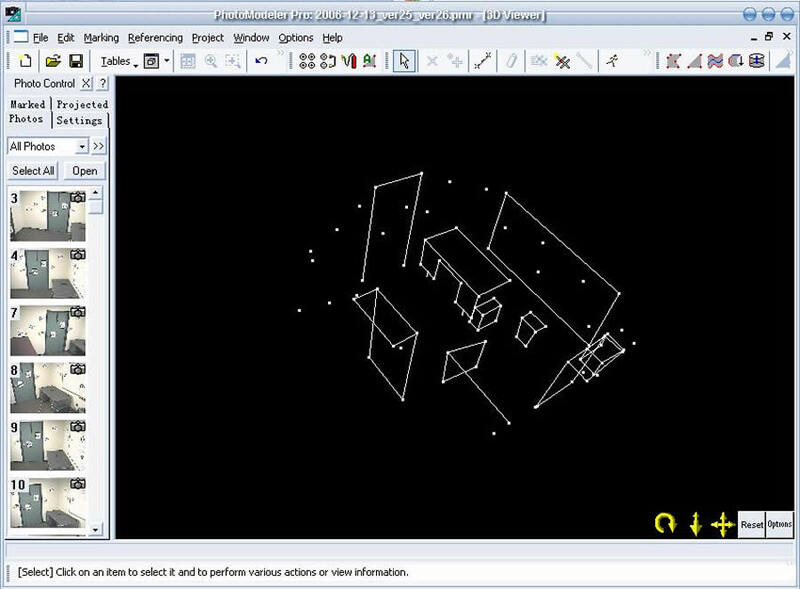 IP camera and Coded Targets give us more choice during the 3D construction model of the real house environment. We can acquire high quality pictures of our targeted environment by manipulating the IP camera without spending time teaching others to take pictures. With the Coded Target Module, we can speed up our process and enhance the efficiency and accuracy of building 3D construction models. With this research, we can conclude that the new technologies can enhance our Virtual Reality Telerehabilitation System. Now, we are planning more comprehensive research with more field applications in order to evaluate the value of the enhanced system with these new technologies. McNeil, JM. (2001). Americans With Disabilities: 1997 U.S. Department of Commerce, Economics and Statistics Administration Bureau of the Census. U.S. Department of Housing and Urban Development, U.S. Department of Commerce. (1995). Supplement to the American Housing Survey for the United States. Washington (DC): U.S. Census Bureau, 7896. JongBae Kim, David M. Brienza. (2006). Development of a remote accessibility assessment system through three-dimensional reconstruction technology. Journal of Rehabilitation Research & Development, 2, 257-272. Kim J. Brienza DM. (2006). The Virtual Reality Telerehabilitation System for Analyzing Accessibility of the Physical Environment: Field Evaluation. Proceeding of RESNA 29th International Conference. This work was funded through RERC on Telerehabilitation by the NIDRR. Opinions expressed are those of the authors and do not necessarily reflect those of the funding agencies. Jing Yue, a doctorial student of Research Centre of Rehabilitation Science and Technology of Xi’an JiaoTong University, China, has worked for this study as an international exchange scholar at University of Pittsburgh since 2006 September.